Soon after leaving the Cordon Bleu, Julia Child began thinking about producing a cookbook, a new kind of book that would be a serious tool for teaching Americans to think about cooking the way the French did—with love and dedication and a willingness to put in time and work. With her French associates Simone (Simca) Beck and Louisette Bertholle, she embarked on what became a ten-year endeavor resulting in the publication of Mastering the Art of French Cooking in 1961. Guided by her belief that a recipe should be written so the cook knows the potential problems that might arise, Julia and her editor at Knopf, Judith Jones, transformed recipes from simple lists of measured ingredients and general instructions to complete explanations of what to do, tool-by-tool and step-by-step. Mastering the Art of French Cooking’s success paved the way for other books written for ambitious and adventurous cooks. It became a classic and was the first of fourteen cookbooks Julia produced throughout her career. In 1952, Julia and her French associates, Simone (Simca) Beck and Louisette Bertholle, organized a cooking school, L’École des Trois Gourmandes (the school of three hearty eaters), for Americans in Paris. The gourmandes vowed to produce a cookbook of classic French cuisine for aspiring American cooks, and teaching allowed them to work out the recipes and methods. 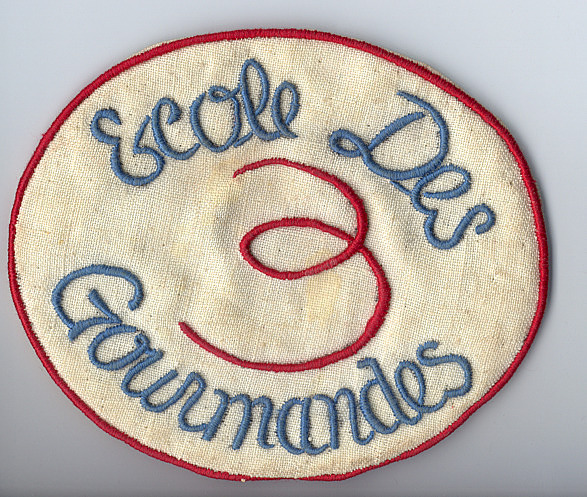 Paul Child designed the insignia badges for L’École des Trois Gourmandes. Julia later wore her badge in America at cooking demonstrations and during her first television series, The French Chef. Gift of Julia Child. The idea was to take the bugaboo out of French cooking. Mastering the Art of French Cooking arrived in America in 1961, the same year a French chef arrived to cook in the Kennedy White House. When New York Times food writer Craig Claiborne announced that chef René Verdon’s first meal featured “trout cooked in Chablis wine and served with sauce Vincent,” interest in French cuisine soared. Julia’s cookbook, followed by her television series The French Chef, tapped into an American public open to wider cultural experiences. Still, not everyone was clamoring for complicated French cuisine. Peg Bracken’s The I Hate to Cook Book, published in 1960, appealed to another, growing segment of the population—busy women who wanted to cook without spending all day doing it. Bracken’s recipes were easy to prepare, both from scratch or by using canned, frozen, and other convenience foods. Its take-it-easy message and humorous approach made the book an instant success, eventually selling over three million copies.